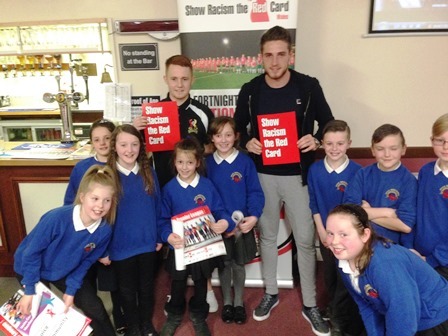 We visited the Rock Stadium to host our educational club event with Cefn Druids FC. Young people from Ysgol Bryn Tabor and Hafod Y Wern primary attended the stadium to take part in the event for the day. Our Campaign worker Jason Webber delivered a workshop in the morning to the young people educating them on the topic of racism using interactive activities and discussions. Druid’s players Lewi Gray & Joe Culshaw attended the event to take part in the press conference joined by Campaign Worker Jason Webber.